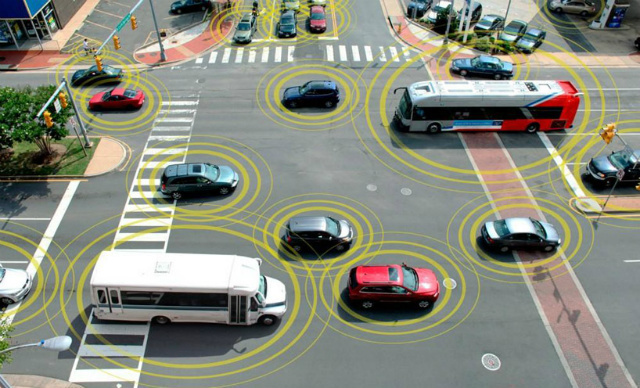 Technology is one step closer to a future where cars will communicate with each other to avoid accidents. The Department of Transportation announced on Monday it was moving forward with the steps necessary to one day mandate vehicle-to-vehicle — V2V — communication technology on light automobiles. The big deal here is that research — including a 3,000-vehicle test of the system in Ann Arbor, Mich. — finds that V2V technology has the potential to "help drivers avoid or mitigate 70 to 80 percent of vehicle crashes involving unimpaired drivers." "V2V crash avoidance technology has game-changing potential to significantly reduce the number of crashes, injuries and deaths on our nation's roads," National Highway Traffic Safety Administration Acting Administrator David Friedman said in a statement. "Decades from now, it's likely we'll look back at this time period as one in which the historical arc of transportation safety considerably changed for the better, similar to the introduction of standards for seat belts, airbags, and electronic stability control technology." The NHTSA will now finish analyzing all the data from that yearlong project in Ann Arbor and will then open that research report for public comment. Eventually, the agency will hand down a regulatory proposal that "would require V2V devices in new vehicles in a future year, consistent with applicable legal requirements, Executive Orders, and guidance." It's important to note that at this stage NHTSA is not talking about self-driving vehicles. Instead, it is talking about a system that alerts drivers to potential dangers. The agency also said that cars would only be sending anonymous "safety data" to each other. We found it on npr.